Here are the cupcakes I was delivered. I am reviewing the Chocolate Cupcake with Peanut Butter Filling. Today I had a chance to try out the Kup-Kakery *creative bakery*, owned by a very sweet woman named Jessie. I was very impressed with the customer service. Shortly after I announced the challenge on my blog, Jessie contacted me and offered to hand deliver an assortment of her cupcakes to my home even though she is several miles away on the west side. We arranged a drop off time and Jessie delivered a beautiful package of cupcakes to me this morning. I was immediately impressed with the packaging and presentation. Packed carefully in a white bakery box with logo were 4 beautifully decorated cupcakes. The lovely purple and yellow pansy cupcake caught my eye and I could see it being delightful for a spring or summer party. After meeting Jessie and seeing how lovely the cupcakes' appearance was, I had very high hopes for the taste. You could say that because they looked good and the owner was so kind, that I was rooting for these to rank right up by the top. Unfortunately, though, I did not care for the taste of the frosting or fillings at all in any of the 4 cupcakes. I randomly chose a cupcake to review when I opened the box and later sampled each. The cupcakes Jessie made for me: Carrot Raisin with Coconut Pecan Filling, Chocolate with Peanut Butter Filling, Butter (Yellow) with Raspberry Filling, and White (Vanilla) with White Chocolate Cream Cheese Filling. For reference, I am reviewing the Chocolate Cupcake with Peanut Butter filling. The texture of the cake was very, very moist. I like a moist cupcake, but this was almost a bit too moist and flaky. The flavor was decent. It did not, to me, taste any better than a traditional box chocolate cake mix. The cake flavor was just a very standard chocolate. It wasn't bad at all, but it was like a decent cake mix flavor. Nothing spectacular stood out to me in the flavor department. My main issue was the taste of the frosting and filling. The peanut butter filling was almost too moist and had almost a plastic-like aftertaste to it. It was like a very moist unsweetened peanut butter. The frosting was very light and moist, but had that same type of flavor I described in the peanut butter filling. In my taste testing of the others, I found that same flavor in all of the others, with the exception of the raspberry filling in the butter cupcake. I would like to say that the Butter cupcake with raspberry filling was the one that stood apart in the bunch--the other 3 ranked the same, but this one was much better. I wish so much that I liked these better. I know it is very hard to follow another cupcake company's perfect score, but I went into this with a completely open mind and am still excited about trying other bakeries. 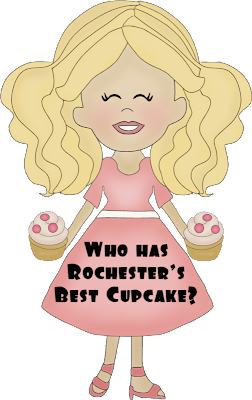 There's so much talent around Rochester and I would love to try others as fabulous as I had Sunday if it's out there. I would, though, recommend Kup-Kakery for events such as showers and birthday parties just because they really fun to look at and you can be sure you'll get great customer care. I also believe in finding the positive traits in things and there were many--the customer service, appearance, and the creativity involved.